For twinkling lights and Christmas trees and presents and family gatherings. It’s also the season for rainy/snowy rides and crazy wild horses, four-year-olds, eight-year-olds and 16-year-olds alike. I was joking with a friend and fellow rider the other day about how wild all the horses are these days. They’ve either been on vacation or aren’t in enough work yet, and they’re bored or they’re wound up from the weather changes, or even all of the above! 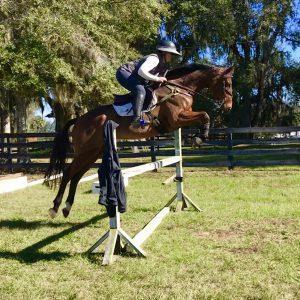 She had just gotten bucked off her very seasoned four-star horse and I had been dealing with trying to keep all four feet of my young horse on the ground because he’d suddenly decided he wasn’t trained anymore. We giggled about it because that’s just part of this time of year. It happens all the time, but it always gets us a little wound up. For her, it’s infuriating to get tanked off of a horse she’s ridden for a decade, who’s been all over the world competing, but still completely hilarious because of course the one that shouldn’t get you always does! For me, it’s frustrating to feel like I was making such good progress with my young one’s education and then a few weeks later to feel like he has no idea what I’m talking about, but then so rewarding to sort it out and have that young crazy talented creature come out better on the other side of the feral attitude. The good ones are always tough; they’re always quirky and they’re always our favorites, even with all their rottenness. I hope mine can grow up and get to see the world like my friend’s wonderful partner! If you’re going through the same thing, no matter your horse’s age or performance status, remember that the craziness is all part of the journey. Remember to laugh about it and remember that if you ride it out (or get back on when you get tanked) you’ll make it to the better side and you’ll most likely learn something along the way (even if it’s just how to stay with the bucking a bit better). Be thankful for all the pieces of this journey we are taking with these incredible animals. Neigh-Lox® Advanced provides complete digestive support to reduce the incidence of ulcers and colic in horses that are traveling.